Christ is Risen and welcomes you to celebrate the joy of the Resurrection! In the Gospel, the discovery of the empty tomb by Mary of Magdala may have been very disappointing or even confusing. However, the fact of the empty tomb is also good news! John, who writes today’s the Gospel, tells us that he entered into the empty tomb. He throws light on the confusion when he writes, “he saw and he believed”. What exactly did Saint John believe? When he saw the empty tomb, he had the insight of faith that Christ was indeed risen as He had promised. Encounter with the risen Lord that same evening changed the disciples completely. To conclude here are three take away points: 1) You and I know that the story of Jesus does not end on the Cross but that the resurrection transforms the disciples and everyone who encounters the risen Lord. 2) The resurrection is the centerpiece of our Christian faith. We can never be the same after encountering the risen Lord. 3) On this Easter day, may the resurrection of Christ transform us so we may live as Easter people throughout this season and throughout the year. Christ is risen! He is Truly risen! Alleluia! Palm Sunday, with its palms, processions, and readings, is one of the special days that can call to mind strong emotional connections in our spiritual history, for those of us who have been in the church most of our lives. For those who are newer to Catholicism and Christianity, I suspect it still makes an impact because of its uniqueness. We heard the story proclaimed today, a story of unbearable sadness and disappointment. A story of betrayal, fear, and denial. A story of pain, suffering, and abandonment. And our God is right in the midst of all of it - embracing it in its totality - carrying the weight and brokenness and sin of the world upon himself. And all Jesus does through it all is love, no matter what is going on around him or being done to him. And we do believe, sincerely. It is also about accepting, embracing and venturing out on a journey, a sacred journey which invites each of us to ask ourselves a critical question, one that has real implications for our lives. We all know that living a life of faith can be tremendously hard and difficult. This Holy Week is an opportunity for us to unite our own journeys, unite our own lives—the good and the bad— with that of our Lord Jesus. But it takes faith. It takes courage. It takes trust and hope. ......but that is not where it ends. Have a blessed Holy Week everyone!!!! We are nearing the end of Lent. Next week will be Palm Sunday and together we will read the account of Jesus’ passion and death. Throughout this time of Lenten fasting, our intention has been to loosen the holding material things have over us. By removing the indulgences of food, drink, and possessions, we are able to focus on what gives our life direction and purpose, our relationship with Jesus. So as we come closer to the beginning of the Holy Week, instead of waning, our spiritual practices of prayer, fasting, and almsgiving should become even more intense. This weekend we are celebrating the third scrutiny for our Elect and our readings are from the Year A. These readings speak about three different meanings of death. For the prophet Ezekiel, death means to be in exile. Paul speaks about death as living in sin. The Gospel of John shares the story about the death of Lazarus, Jesus’ beloved friend. Jesus asks the Father to return Lazarus back to the living. By doing this God’s glory is manifested in the earth and Jesus’ followers will be transformed. They will believe in him. But Jesus’ death is still ahead and it will be another transformational moment. Within the violence of the crucifixion, Jesus’ infinite love will transform the violence into the ultimate reconciliation of humanity and divinity. In longing to be conformed to Jesus’ death, we are asking for the grace to become the light that is stronger than darkness, the love that is stronger than hatred, the life that is stronger than death. Let us persevere in our Lenten practices confident that the God of life will bring us to Easter joy. Halfway into the Lenten season, we pause with the whole Church to rejoice on this “Rejoice Sunday.” This Sunday we use desert rose color vestments to symbolize that joy. All three readings this Sunday help us to see a sharp contrast between light and darkness. In the first reading, Samuel struggles as it were in darkness, trying to find a king, but can only succeed to find the young David when he begins to see as God sees. In the second reading, Paul reminds us that we were once darkness, but now because of our Baptism, we are light in the Lord. We are therefore challenged to be bearers of the light. The story of the man born blind in the Gospel bears all the features of Lenten themes of conversion. It contrasts sharply the vision of the man born blind, who seeing Jesus with his eyes of faith, and the blindness of the Pharisees, whose eyes of their minds are closed towards Jesus. The Gospel reminds us that our Baptism enlightens us to see and embrace God’s vision, life, goodness, and truth. Our Baptism commits us to be bearers of the light and to confront the spiritual blindness of the world with the light of truth. The passage clearly contrasts light and darkness, faith and the stubborn refusal to accept the truth. In the story, Jesus not only gives the blind man his sight, physical light, but he also gives him the light of faith. The story is about you and me in moments of our own spiritual blindness and darkness. In our selfishness; our inclinations for indulging in vices and pleasure; in our greed for material things, we become spiritually blind and lose our spiritual sight. Just as in the Gospel story, we must not allow dishonesty and the distortion of the truth to dim our light, because Christ is our Light and we are bearers of that light. Come to Christ, The Eternal Living Water. Water is one of the most important requirements for the sustenance of life. The first reading of today tells us of the ordeal of the Israelites in the wilderness. They grumbled against Moses, and against God because they were thirsty. God instructed Moses to strike the rock. From it, water came forth. The Israelites drank and were satisfied. In today’s gospel, Jesus presents himself as both the rock of our salvation and our eternal living water, who desires to satisfy our deepest thirsts. The story of the meeting of Jesus and the woman at the well started with a simple request from Jesus, “Give me a drink.” It was a hot day and he and the disciples had been walking in the hot sun for a long time. He surely needed water for his parched throat. But Jesus had a deeper thirst - his real thirst was for this woman’s faith and salvation. Like Jesus. the Samaritan woman was thirsty too. That's why she came to draw water from the well. But in reality, her thirst was more than water and Jesus could see that. In their conversation, Jesus gradually uncovers this woman’s great thirst for truth – a thirst that perhaps she had not noticed, burdened as she was with her sins and the daily hardships of life. Jesus promised her living water. At first, she believes that the living water of which Jesus speaks is material water that can quench physical thirst, which is what she’s primarily concerned with. As their conversation progresses, Jesus reveals His identity more as He reveals to the Samaritan woman her sins. And here we begin to see a change. Notice that she no longer asks about water or worries about quenching her thirst. Now she asks about doctrine! This woman was also thirsty for God. Eventually, when Jesus reveals that He is the Messiah, the woman runs throughout the town proclaiming her faith in Him, heedless of the shame of her past sins. The Samaritan woman represents all of us as we thirst for truth, as we thirst for God. But she also represents us in our sinfulness, showing us the obstacles to our conversion, for all of us, have past sins to repent of before we can come fully to Christ. Today’s Gospel reminds us of the spiritual thirst we all have for God, and that the living water that alone can satisfy this thirst is found only in Christ and in His Church, and that we must put all else aside to attain this living water. The good news is that Christ is also thirsty for our conversion. May we, like the Samaritan woman at the well, readily and humbly acknowledge our sins and nourish within ourselves a constant thirst for the living water of God’s grace and mercy that we find in the Sacraments! On this Second Sunday of Lent, we are revisiting the story of the transfiguration of the Lord Jesus. The readings are calling us to be like Christ. We too must become transfigured because it is from our own transformation that we will help to inspire others to think seriously about becoming Christians. We are called to become an icon of Christ, an attractive ‘keyhole’ through which people will see the love of God. Today, we are challenged not to dwell on Jesus’ transfiguration, rather, to continue or perhaps to begin working on our own. When we look at our own transfiguration we need to consider three things: first, the Transfiguration gives us perspective. We are made in the image of God and no matter how rough, how unpolished, or how ordinary we maybe we, like Jesus, have divinity within us. So, we are called to act like Jesus did so we can inspire others with our actions. Second, our journey of faith involves struggle. The way of the cross does involve suffering, and as we transform to be like Christ, we will experience some of that suffering. We need to accept it and pray that our suffering here will earn us rewards later in heaven. Lastly, the transfiguration of Christ keeps us centered. St. Paul invites us to center on the goal but to also remember that to reach that goal involves some sacrifice from our side. However, for us, the sacrifice ends at the Eucharistic table. When we come to the Eucharistic table, we bring all of our sufferings and joys and in turn, we receive Christ transfigured. In this holy season of Lent, my prayer is that as we prepare to be fed by the Body and Blood of Christ we be open to listen and accept that it is only through our own transformation that we are going to be able to become ‘keyholes’ - true icons of Jesus. God wants us to become the ‘keyhole’ through which others will see His glory. This Sunday’s gospel reading, we see Jesus alone in the desert being tempted by the devil. The devil presents a few interesting scenarios to Jesus, ones that test him and tempt him at the same time. And in each scenario Jesus is somehow able to resist and is able to stay focused on what he was born to do, stay faithful to his Father in all things. Jesus is not willing to give in to what many of us so often give in to, the need for power or prestige of glory or a chance to “show off”. Rather, Jesus came simply to serve and to save. We’re just beginning Lent, our own “forty days in the desert”. And during this holy time we will take a deep look within, examine the ways we have been faithful and the ways we have not, examine the ways we have stayed on the path and the ways we have strayed, examine the ways we have met the needs of others and the ways we have placed our own needs above those of others, examine the ways we have loved and the ways we have chosen to do something else. And Lent is the perfect time to take a long hard look at those very things, take a long hard honest look at our sins, no matter how difficult that may be, so that we can be better, we can be more, so that we can be the beautiful, loving, kind, generous people God wants us to be. That is what Lent is really all about. We often wonder why Jesus was so successful in his ministry. The readings of this Sunday give away the answer to that question. The words we use may lead others astray, or bring them closer to God. The first reading from the Book of Ecclesiasticus uses four concrete examples to illustrate how good or bad results from a sieve, a furnace, a kiln, and an orchard can be compared to how speech reveals a person’s inner defects, flaws, and quality of life. So just as the orchard is judged by the quality of its fruit, similarly a person’s words say more about his character. The message we take home may be summed up in three points. 1) The integrity of Jesus and his union with the Father in prayer was the secret of his success. 2) Only filled by his Spirit can we speak and act in a manner that truly witnesses to Christ. 3) Just as Jesus, the key to authentic witness is only found in faithfulness and union with God. This Sunday we hear some of the most difficult teachings of our Lord, Jesus Christ Today’s gospel continues the Great Sermon of Jesus from where we left off last Sunday. After speaking about the persecution and violence that will be visited on the disciples, as was done to the prophets of old, Jesus now speaks to the disciples about how they are to respond to the hostility. He begins: “But I say to you that listen, love your enemies, do good to those who hate you...” (6:27-29). The disciples lived in a society that hated them and treated them with hostility. What Jesus is asking them is that they should not return hatred for hatred or hostility for hostility. By nature, we love only friends and dear ones. Loving enemies is not only something we do not do but something that we can hardly do. But Jesus today presents the Golden Rule and even raises it up to a higher level. Not only should we treat others as we would want to be treated, not only should we love those from whom we expect love in return, but also, we are called to love our enemies and lovingly treat people whom we know will not treat us in the same loving way. The story of David (in the first reading) illustrates this point. Saul hated the much-admired David; he had become insanely jealous of him. He pursued him to get rid of him. When David had the opportunity to assassinate Saul who was asleep together with his soldiers, he refused to do so. Such was David’s, noble heart. Jesus, in today’s Gospel, makes another step forward: he will invite us to go beyond the same forgiveness. He will demand from his disciples not only to do no harm to the enemy but that they take the initiative to meet him to help him out of his condition. “Give to everyone who asks you; …do good to those who hate you…” (6:30). Reflecting on these readings, I am conscious of the fact that Jesus raised the bar higher and higher for His disciples. The goal which Jesus places before us is to be like the loving, divine Father, who forgives, loves, and cares for us even while we are sinful. We are also called to be like the One who calls us to be His disciples. We may find this too much to achieve. There is no way we can be as forgiving, as loving, and as caring as God. We will fail. The fact that we will not achieve such a high level of concern for others is not what is to be the focus of our attention. Our attention should be on the One Whom we are trying to imitate. The more we strive to keep our eyes on Jesus, our Master-Teacher and upon his Father, the more that Jesus can, and will fill in the gaps. This Sunday the readings underline deep-rooted trust in God as the key to real joy, peace, and happiness as contrasted to the illusion of finding that same joy, peace, and happiness outside of God and the Church. In the face of many challenges and demands by God and the Church for faithfulness, why do we continue to hang around instead of just quitting? The prophet Jeremiah and Jesus in the gospel respond to those questions in the First reading and the Gospel of today. Jeremiah offers us a number of metaphors, but perhaps one that is most significant is the image of a tree planted beside the waters. The tree is an image of the true disciple. In spite of drought and devastation all around, it stands quietly by the waterside, its foliage green, its branches full of fruit. Jeremiah says that the tree thrusts its roots not on the surface ground, but into the stream. So how do you and I get to be like that tree? In the gospel passage, we find the mystery of God's love for the poor and the poor person's childlike trust and dependence on God. In Luke’s version of the Beatitudes, it is not material poverty that Jesus calls blessed, but those who are helpless, without influence in society, the voiceless, those uprooted from their justly acquired land, the jobless, hungry, homeless, who put their total trust in God who cares for them. Happy indeed is the person who trusts in the Lord. 1) Trust in the Lord is the secret key to unlocking true joy, peace, and happiness. 2) The Church is the running stream beside which you and I must remain planted if we are to grow and survive. To stop coming to Church is to uproot ourselves. 3) Those who put their total trust in God are blessed and happy as contrasted to those who put their trust in material things. The first reading is about the call of Jeremiah who is chosen by God even before he was born. “I have appointed you as a prophet to the nations…Stand up and tell them all I command you”. Jeremiah is also warned that his mission will not be easy because his message will certainly meet opposition. The only reason why Jeremiah accepts such an unpopular mission is God’s love and faithfulness in the midst of persecution. “They will fight against you but shall not overcome you, for I am with you to deliver you”. This is a clear reminder that it is not the eloquence of God’s messengers that count, but their clear witness to God’s love. Against this background, we see the meaning of Paul’s message in the second reading. Without the kind of love that Paul speaks about, Jeremiah or any messenger of God will fail. Love that is patient and kind and never jealous; a love that is always ready to forgive, to trust, hope and endure whatever comes, is a powerful driving force. That love sustained Paul in his own ministry till martyrdom in Rome and the same love inspired Jesus in His ministry. The Gospel passage is a clear reminder that when God’s messengers speak the truth in love, they risk rejection and opposition. Jesus in the Synagogue faces such rejection not because he is a local young man of Nazareth, but because his biblical message about God’s universal love and salvation contains a truth that the audience cannot deny, and that angers the religious and political leaders. He is immediately considered dangerous and subversive. “They sprung to their feet and hustled him out of the town…intending to throw him down the cliff, but he slipped through the crowd and walked away”. The readings remind us that our call to discipleship like that of Jeremiah and Jesus Christ must be rooted in love. We are also assured that God never abandons his faithful messengers when they speak the truth in love. Both the Gospel and the first reading of this Sunday proclaim a message of liberation to the poor. In the first reading the Israelites have just returned from their long exile in Babylon, where they have been greatly humiliated, and so their spirits are down. They need a word of encouragement to help renew them spiritually and offer them a strong motivation and renewal. Ezra the priest understands their situation and uses the regular worship as a moment for spiritual recommitment as he reads from the Book of the Law of God. We are told that “all the people listened attentively”. The message seems to touch the audience deeply, and the people are ready to recommit themselves to their God and to embark on a spiritual, moral and physical renewal of Jerusalem. Here we find a good pastoral example in the way the priest Ezra applies the Word of God in a concrete situation with great success in the spiritual renewal of the people. In the Gospel reading, Jesus like Ezra reads a Scripture passage in the Synagogue. The passage given to Jesus from Isaiah is a concrete fulfillment in his own person and ministry. He declares that “This text is being fulfilled today even as you listen.” The passage is a summary of Jesus’ pastoral plan of establishing his kingdom that is already accomplished. Jesus is sent by the Father, “to bring the good news to the poor, to proclaim liberty to captives and to the blind new sight, to set the downtrodden free and to proclaim the Lord’s year of favor”. In blending this text from Isaiah with the words of Jesus at the end, Luke highlights the fact that indeed Jesus is the Messiah foretold by the prophets. As we begin the Ordinary Time of the Year, the readings remind us of some themes we heard over the Christmas season. They outline several themes on the manifestation of the Holy Spirit in the new era inaugurated by Jesus Christ. One overarching theme is renewal. In the first reading, the prophet Isaiah uses poetic metaphors that point to the renewal of God’s people. In that call for renewal, God promises to give his people a new name: “My Delight”. The Lord will espouse you; make you his bride and delight in you as a bridegroom delights in his bride. That marriage metaphor describes a new relationship with God that transforms our humiliation and setbacks to exaltation and joyful triumph. All that newness is from God, who creates a new people; a new land out of desolation; a new Spirit-filled community. In the Gospel passage, the miracle of changing water into wine by Jesus is a metaphor for the transformation of the world realized in the proclamation of the kingdom, in the ministry of Jesus that now begins publicly. The Church has traditionally seen this first sign by Jesus as the fourth manifestation in sequence since Christmas, Epiphany and the Baptism of the Lord, which is followed by the story of Marriage of Cana. In this event, God reveals his Son again in the context of a marriage relationship. He works the first miracle in order to give a temporal favor, an earthly gift to save a newly married groom from embarrassment. The miracle is also a self-manifestation of who Jesus is. Just as He can change water into wine, similarly He can change our past into a different future; our talents into wonderful gifts for the Church. Jesus transforms ordinary lives to accomplish an extraordinary mission of entering into communion with Him and the Triune God. Today, we celebrate the feast of “The Baptism of the Lord” by John the Baptist in the Jordan River. And in so doing, the Church invites all of us to renew our own baptismal promises, so that we can live ever more transparently as a disciple of Jesus, trying to do what is right, and true, and good, and beautiful. It is very true that we receive baptism only once in our lifetime, but it is never a one-time event. We step into those waters once. We walk through that doorway once. We are bonded to the family of faith, the Church, once. And yet, the promises, and possibilities, and challenges of baptism are ongoing. Our commitment to Jesus is not a one-time thing. It’s a daily thing. And our need to be washed clean and created anew was not a one-time thing either. It’s a central part of an authentic journey of faith --- a journey on which we strive to be the beautiful people God created us to be, Jesus died for us to be, and the Holy Spirit descended for us to be --- even though we know in our hearts that we will sometimes stumble and fall. And so, let us not treat our baptisms as something that simply happened long ago. Rather, let us acknowledge our continual need to be healed, to be cleansed, to be made brand new once again. And may every time we do the simple act of dipping our fingers in holy water at church be an opportunity for us to give thanks to God for our baptism long ago, and also be an opportunity to recommit ourselves to living as children of God, clothed in Christ, pouring out God’s love and mercy and understanding everywhere we go - and this is the Good News of today. The word ‘epiphany’ means to make known or to reveal or to manifest. John describes Jesus who was born in the darkness of night as “the light (that) shines in the darkness…. the true light, which enlightens everyone… (John 1:5, 9)” Today’s Feast of the Epiphany tells us that this light that has come into the world now reveals himself to the human race. The angels made known to the shepherds the joy of the birth of Jesus. In the same way, the star led these strangers, the magi, from the East and revealed the same Jesus to them. Through the birth of Jesus and today’s wonderful feast, we are the people on whom a great light has shone. And like the shepherds of Jerusalem and the magi from the East, we have come from various corners of the world to adore him. Our first reading from the Prophet Isaiah calls us to ‘Arise, shine out because our light has come, the glory of the Lord is rising in us…” These Magi were “wise men” who studied the stars and were aware of the Jewish belief that a Messiah was coming. God used what they were familiar with to call them to adore Christ. He used a star. So, the first lesson we take from this for our own lives is that God will use what is familiar to us to call us to Himself. Look for the “star” that God is using to call you. A second thing to note is that the Magi fell prostrate before the Christ Child. They laid their lives down before Him in complete surrender and adoration. They set a perfect example for us. If these astrologers (pagans) could come and adore Christ in such a profound way, we must do the same. Adore Him with a complete surrender of your life. Thirdly, the Magi bring gold, frankincense, and myrrh. These three gifts, presented to our Lord, show that they acknowledged this Child as the Divine King who would die to save us from sin. Gold is for a King, frankincense is a burnt offering to God, and myrrh is used for one who would die. Thus, their adoration is grounded in the truths of who this Child is. If we are to adore Christ properly, we must also honor Him in this threefold way, by giving him the best of ourselves. Finally, the shepherds did not stay at the stable after seeing Jesus; they left glorifying and praising God. Just as the angels had proclaimed the good news to them, the shepherd in their turn shared their good news with others. In the same way, the visitors from the east, after they had given Jesus their gifts also left the stable. We can only assume, that they too told everyone what they had seen and heard in that small stable in Bethlehem. As we look upon the crib, we cannot stay there. Like the shepherds and the magi, we too are called to move away and take the light of Jesus with us. Through the quality of our daily lives and how we treat each other, we are called to make our families, homes, parish communities and the wider world a better and brighter place for all people, especially the poor and the marginalized. Today, we are celebrating the Holy Family of Jesus, Mary, and Joseph. The Church sets the Holy Family before us as a model of what our families should be like. And while it’s a day to take a close look at the Holy Family, to admire the Holy Family, and to give thanks to God for them and for their example, it’s also a chance for us to look at our individual families. And not just in a superficial way, but to actually think about what can/should/will make our families holy. Our holiness comes from our connection to God, from our relationship with God. 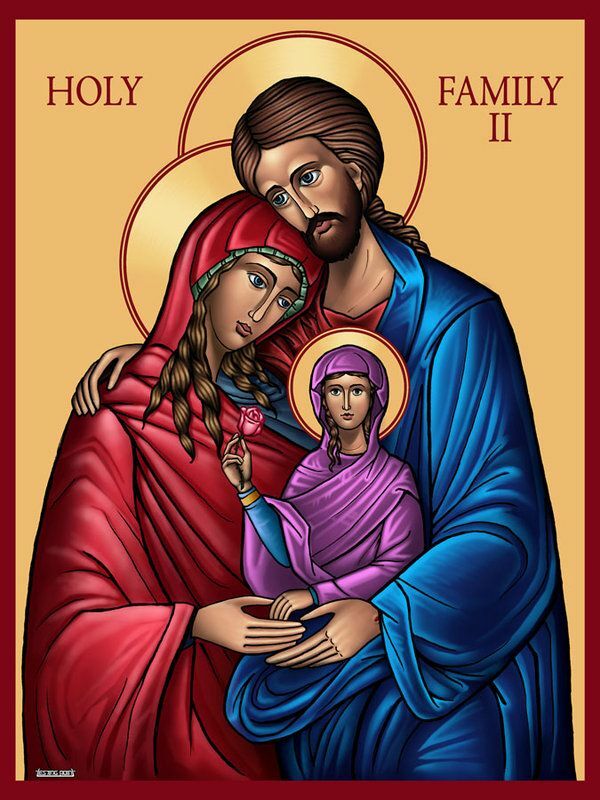 A holy family walks with God. And just as that Holy Family welcomed God, we are to welcome the gift of each other that God has given us. When we look at our own families we see many ways we can live out that call to service. Husbands and wives serve each other to achieve their salvation. To be a parent is to be a servant. We pray for and with each other. We learn from the Holy Family that we are to walk with God, that we are to serve each other. And if we do this, then we make our little corner of the world holier. We allow God to make our lives holy. Thank you, Jesus, for helping us build holy families. Mary and Joseph, please pray for us --- that our families may come to reflect the best in yours. On this final Sunday of Advent, God through the prophet Micah promises a unique Savior, born in David’s town of Bethlehem; a Savior who will stand and feed his flock and establish peace. The prophet speaks of God bestowing on Bethlehem the distinction of being the birthplace of an ideal ruler of Israel. However, only God knows when this ruler will come. When he does come, he will be the true shepherd of Israel and the servant of God. Significantly, the Messiah “shall be peace” and bring about total harmony among the nations and the ends of the earth will hear of his wisdom. Luke in the gospel very skillfully sets the stage for the coming of the Messiah. The Visitation of Mary to Elizabeth focuses on the meeting of the two expectant mothers which is also the meeting of their sons. Before the mystery of Mary's greeting, Elizabeth is filled with the Holy Spirit and praises Mary for her faith and trust in God. This beautiful meeting leads us into the very center of Advent, namely the prayerful anticipation of the mystery already among us. As we approach Christmas, we are called to imitate Elizabeth who recognizes and rejoices in the humble presence of Christ our Savior. Like Mary in her obedience of faith, we are called to believe that the promise made to us by the Lord will indeed be fulfilled in the mystery of Christ’s presence in our lives. We are constantly challenged in our faith to take Christ to others as Mary did, so that Christ who is secretly present in us, may touch the lives of others. Like Mary, we are called personally and as a parish community to go out and share the Good News of salvation with others. As we approach Christmas, like Elizabeth we recognize and rejoice in the presence of Christ our Savior. Today is “Gaudete Sunday,” Rejoice Sunday. That same sentiment is echoed in the first reading from the prophet Zephaniah: “Shout for joy, O daughter Zion!” “Sing joyfully, O Israel !” We’re only nine days away from Christmas, and so we light a rose-colored candle, we use rose-colored vestments, we hear these enthusiastic words of rejoicing and joy. This season, for our joy to be complete, we have our own role to play. This role is what John the Baptist spelt out in today’s gospel. For our joy to be complete this season we must be charitable, forgiving, caring, just, modest in all our actions, seek reconciliation and peace. We must shun all acts that are capable of making life difficult for others. We need patience and constancy which are very important spiritual virtues. Patience and constancy in the practice of God’s commandments this Advent will lead us very soon to sanctity and the fullness of joy. As we wait joyfully for the fulfillment of Christ’s promises to us this season, may the Almighty God fill our hearts with charity and goodwill. As we continue our spiritual journey in this season of Advent, our liturgy reminds us that the past, present, and future coming of Jesus into the world is the fulfillment of the saving plan of God. Our readings for this 2nd Sunday of Advent seek to help us to make ourselves ready to receive him. In the first reading, Isaiah consoles the Jewish in Babylon by assuring them that the Lord will restore their homeland to them and care for them as a shepherd cares for the sheep. The Gospel tells us that the restoration of the fallen world has already begun, starting with the arrival of John the Baptist, the messenger and forerunner of the Messiah. John speaks of one, more powerful than he – Jesus Christ – who will baptize us with the Holy Spirit. Surely Christ made his first coming and each of us has received the gift of the Holy Spirit in Baptism. Our Second Reading makes it clear that the salvation promised by Isaiah was not completely accomplished even by the first coming of Jesus. It is only when Jesus comes again at the end of time that Isaiah's words will be entirely fulfilled. Hence, Peter warns against false teachers who have given up any expectation of Christ’s return because of its long delay. So Peter reminds them that even though the Second Coming seems to be delayed, Christ will indeed come as promised. The fact is that the risen Lord is eternal and infinite and so is not measured by time in fulfilling promises. Besides, God “is patient” with us, giving us more time to repent of our sins and renew our lives. We are, therefore, invited by the Church to prepare to receive Christ by repenting of our sins and renewing our lives so that Jesus may be reborn in us. We do this when we turn this Advent season into a real spiritual “homecoming” by allowing Christ to radiate his presence all around us. John’s preaching reminds us also of our important task of announcing Christ to others through our lives at home and in the community. When we show real love, kindness, mercy and a spirit of forgiveness, we are announcing the truth that Christ is with us. Thus, our lives become a kind of Bible which others can read.